The fundamental difference between Western style knives and their Japanese counterparts, is the fact that the Western knife is sharpened on both sides of the blade. They therefore have what is called a symmetrical bevel. This obviously has an impact on the way the Western knife is sharpened. When choosing a knife sharpener for western style knives you need to ensure that the tool is able to sharpen both sides of the blade. You will also hear much about the angle of an edge when it comes to sharpening. With a Western knife, the combined angle of each edge is the overall angle you must pay attention to. Factory edges for Western knives range between 18 to 28 degrees as a result – a figure far higher than that of the average Japanese style knife. Western style knives also differ to Japanese in that many designs are curved along the blade. You utilise this design feature every time you rock your knife to and fro in a chopping action. The curve allows you to apply different amounts of pressure to specific areas of the blade. This curved shape of Western style knives obviously means that when choosing which knife sharpener to buy, you should check that it has the facility to sharpen your knife all the way along the curved edge. The blade thickness is another difference between both knife styles. Traditionally, Western style knives are built using softer steel. In order to give the knife the required density and strength, more material is required. As such, you will often find that a Western style knife is more robust. The softer steel used in Western knives does mean that the edges become dull faster than the average Japanese knife. Heavy use will see imperfections appear along the blade, however, the fact the material is softer, means most Western style knives can be sharpened with great effect. The Victorinox Fibrox Straight Edge Chef’s Knife, 8-Inch, is a fantastic yet affordable western style chef’s knife that has proven extremely popular with customers. 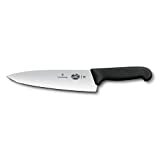 Well the 8 inch chef’s knife features a high-carbon stainless steel blade that is sharp right out of the box. Edge retention is good too. The blade is conical ground lengthwise and crosswise. If you don’t know what this means, do not worry – the end result ensures a more efficient cutting process as the blade has less resistance. True Swiss design expertise has gone into the manufacture of this knife, with laser tested technology having been employed to ensure optimum cutting power. For a sure grip, the patented 2-inch Fibrox handle is textured, slip resistant, and ergonomically designed. Add all of this to the Victorinox lifetime warranty and you have one of the best consumer priced chef’s knife available today. If you have read the section above, you will already know that the biggest difference between a Japanese style and western style knife, is the fact the Japanese knife has a single bevel – in other words, the blade is only sharpened on one side. Because of this single bevel angle on Japanese Kitchen knives, they are often sharper than their western style counterparts. Japanese knives can have a bevel angle as low as 5 degrees. The most important factor to look out for when choosing a sharpener for Japanese style knives is that you have control over which side of the blade you are sharpening. If the sharpener automatically sharpens both edges of the blade, you will clearly ruin your knife. As we have already mentioned, Japanese knives are generally made from harder steel than western knives. This allows for the edges to hold sharper for longer. While the blade is able to withstand wear and tear to a greater degree than western knives, the harder steel can be brittle. It is imperative that you use the correct type of Japanese knife for individual tasks. Whereas a western chef’s knife may be able to cut through a chicken bone, doing so with a Japanese chef’s knife could see you ruin the edge. Japanese style knives also differ in that the shape of the blade is very rarely curved. Being long and straight, you should be careful to check that any knife sharpener you buy can efficiently sharpen knives of this shape. We’re a big fan of the Yoshihiro range of kitchen knives here at Sharpen-up. (You can read our in depth look at some of the best Yoshihiro knives here). The company expertly combines top quality craftmanship with an aesthetic beauty that really sets them apart from other Japanese knife manufacturers. With that in mind, it is almost a natural choice for the Yoshihiro VG10 16 Layers Hammered Damascus Gyuto Japanese Chefs Knife to get our top pick for 2016. You can pay crazy money for a top of the range Yoshihiro knife, however the 16 layered Damascus is a lot more budget friendly. Furthermore, the design quality has not been compromised as this is not a mass produced instrument. Each individual knife is handcrafted by skilled Japanese knife-smiths. The Gyuto Japanese Chefs Knife is forged using a 3 layer construction. 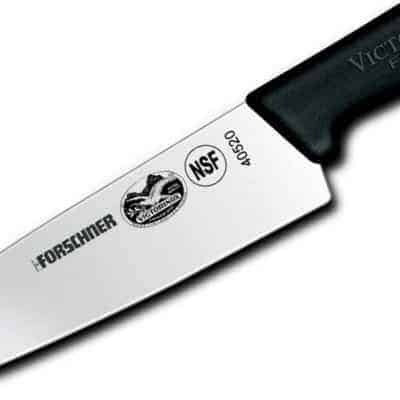 Quality VG-10 Japanese stainless steel is used for the center core with a HRC 60 edge providing professional level sharpness, edge retention, and durability. 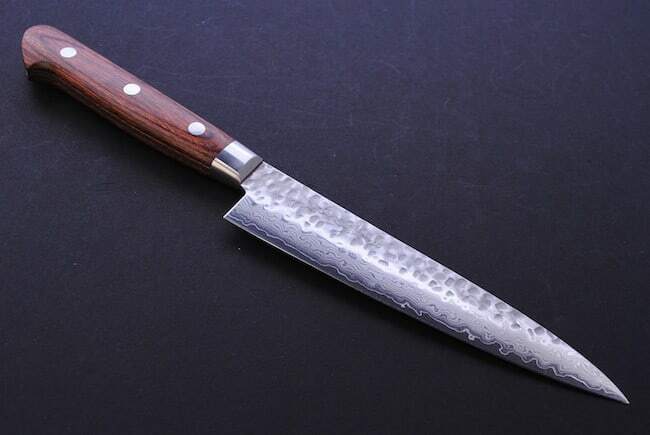 The aesthetic beauty of a knife of this calibre stems from the elegant 16 layer hammered outer steel. Not only does this look the part with the intricate pattern that it creates along the blade, the design also eliminates friction and stops food from sticking to the knife. 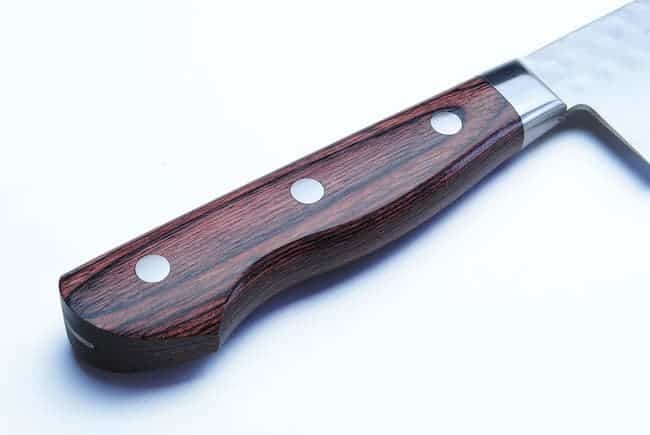 This attention to detail continues through to the handle, where premium mahogany is used in a full tang construction. The end result is a wonderfully balanced Japanese chef’s knife that is a dream to use. If you are in the market for a top quality Japanese chef’s knife that won’t break the bank, your search ends here.